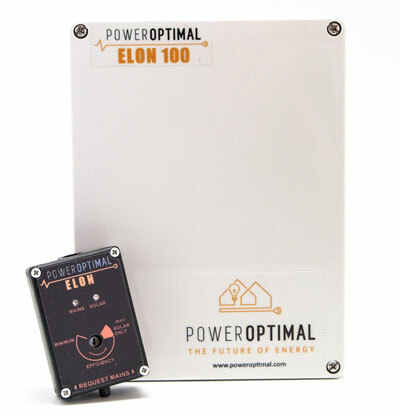 The PowerOptimal Elon operates on a very simple principle: it enables direct current (DC) electricity produced by solar PV modules to be used directly for water heating using a standard electric geyser with alternating current (AC) heating element and AC thermostat. The system can run completely off-grid, or with grid AC power as backup. No inverter and no battery! 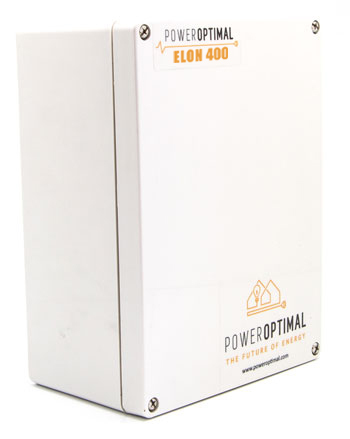 The innovative PowerOptimal Elon™ 100 incorporates proprietary solar PV (photovoltaic) power management technology to allow for direct solar PV DC to electric geyser power provision and switching and optimised solar power use in a single compact unit. 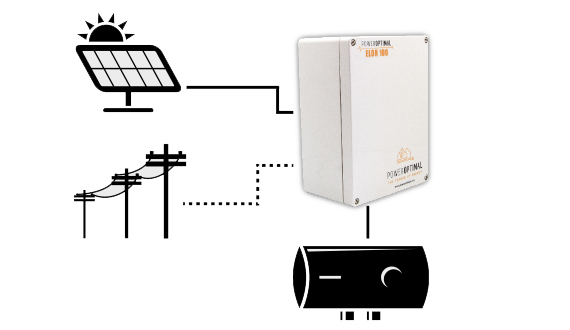 The system can be connected to the grid (AC mains) as well, and intelligently switches between AC and solar power supply. The system requires no inverter and no battery and can be connected to standard AC geyser heating elements and AC thermostats, which translates into the most cost-effective solar water heating option today. Heat your water with the power of the sun! The Elon 400 adds remote metering, automated demand management and dispatchable demand response capabilities to the Elon 100. This translates into the most cost-effective option for utilities to add new generation capacity to the grid. The remote metering capability enables utilities to generate revenue from distributed generation, whilst no additional transmission or distribution infrastructure is required. Since water is used as a thermal battery for solar power, the impact of solar intermittency on the grid is mitigated. The automated demand management and dispatchable demand response capabilities provide the ability to utilities to manage peak power demand and supply-demand imbalances.